Thank you Cassie as always! I am going to make that Banana Cake with Peanut Butter Frosting! Thank you for posting such delicious recipes!! Hugs! You have some delicious recipes Sharon! Thank you for posting them! I am very happy to have them in my book. I always buy my books and I can't wait to get this one! Thank you again Pat for your delicious recipes! So many of these I want to try! I love your Mom's version of Goulash! I love all your recipes! Thank you Cosette, I appreciate the kind words and the yummy recipe! Nothing better with fish than butter and lemon! Thank you Connie! I love Spinach Souffle's and can't wait to try yours! Got to try that Easy Hot Dog Casserole too! I love hot dogs and everything in it! Thank you Martha for the yummy recipe! Thank you Tammy for including my recipes in your cookbook...hugs! I cannot tell you how much it means to me that you have included my recipes in your wonderful cookbook. Thanks so much. Great Book. 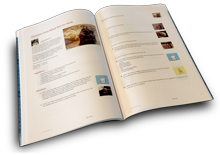 Thank you Tammy for using 3 of my recipes in your cookbook..enjoy! Thank you Tammy for including my recipe in your cookbook (Fish fillets with Brown Better, page 58). Awesome cookbook :) thank you for using one of my recipes. Tammy, I am honored that you included my 'Easy Hot Dog Casserole' in your really AWESOME cookbook! WOW! What a great cookbook!